Dt. 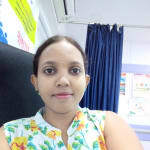 Neetha Dilip is a popular Dietitian/Nutritionist in KGH Down, Visakhapatnam. She has been a successful Dietitian/Nutritionist for the last 12 years. She is a qualified M. Sc. Foods, Nutrition & Dietetics, B.Sc-Home Science. She is currently associated with One Health My Nutri Diet Clinic in KGH Down, Visakhapatnam. Book an appointment online with Dt. Neetha Dilip on Lybrate.com. Lybrate.com has a number of highly qualified Dietitian/Nutritionists in India. You will find Dietitian/Nutritionists with more than 39 years of experience on Lybrate.com. Find the best Dietitian/Nutritionists online in Visakhapatnam. View the profile of medical specialists and their reviews from other patients to make an informed decision. Dr. Neetha is a qualified nutritionist with a good knowledge on diet nutrition and human metabolism. She prescribes correct diet with backed by proper assessment of the person concerned. She also is innovative in creating nutritional product which are sure to catch your eyes and apetite. I recommend her to be a good and empathetic dietician who provides practical and feasible solutions to diet of an individual. She is very knowledgeable. She has lot of experience. Initially she let me speak for some time and she was making notes. I was like what was she doing. Later she really gave me such a nice guidance that I can see positive changes from 1st week. She gave me a follow up call and made sure I am following everything. She is very good. I found the answers provided by the Dt. Neetha Dilip to be very helpful, knowledgeable, thorough and professional. Well explained thank you so much. I found the answers provided by the Dt. Neetha Dilip to be very helpful. I m doing regular exercise in morning definitely it reduces the fat. Dt. Neetha Dilip provides answers that are very helpful and knowledgeable. Thank you doctor. Dt. Neetha Dilip provides answers that are well-reasoned. Thank you for your suggestions. Sir, My body growth is very low,how will I get muscular and developed body which medicine will be useful for me. I can tell you that to gain weight, you need to focus on making your meals a habit rather than an afterthought. Your body is pre-programmed with your genetic disposition. And in your case, you have a very fast metabolism that digests and burns calories quickly. Focus on having 5-6 calorie-dense meals a day spaced 2-3 hours apart so that your body is constantly being provided with something to metabolize and build muscle. I am a vegetarian, as I am regular at gym, I have to consume around 180 g protein daily in my diet. Currently I take around 4 scoop of whey, 2 in morning and 2 in evening, then casein, nuts, beans, yogurt, lentils etc. I wanted to get advice on can high protein diet lead to any kidney or heart problems? I do take high protein low carb diet. Yes sudden increase of protein esp supplements may lead to hazardous effects on kidneys. Please follow a Clinical nutritionist advice and enjoy best results. I can't seem to lose weight irrespective of eating in a controlled manner. I have left sugar completely. What do I do? Don't eat sugar and avoid sugar-sweetened drinks. ... Eating more protein is a great long-term strategy to reduce belly fat. ... Cut carbs from your diet. ... Eat foods rich in fiber, especially viscous fiber. ... Exercise is very effective at reducing belly fat. Please take personalised customised diet consultation for best results. I am a 16 years old girl, my weight is not more than 29 kilo, I want to gain weight .So please suggest me a weight gaining powder but without side effect .It can take 3 months or more but it should safe or without side effect. 1-endura mass. 2-Accumass. 3-nutrigain. 4-Patanjali badam pak. Or Other that is best for weight gaining and safe. Here are some energy-dense foods that are perfect for gaining muscle : Nuts: Almonds, walnuts, macadamia nuts, peanuts, etc. Dried fruit: Raisins, dates, prunes and others. High-fat dairy: Whole milk, full-fat yogurt, cheese, cream. Fats and Oils: Extra virgin olive oil and avocado oil. Doctor I am (veg) but eat eggs so what to eat to gain muscle. Earlier I use to in obese 86 kg but today I am 68 kg tell me the food to eat. Here are some energy-dense foods that are perfect for gaining weight: Nuts: Almonds, walnuts, macadamia nuts, peanuts, etc. Dried fruit: Raisins, dates, prunes and others. High-fat dairy: Whole milk, full-fat yogurt, cheese, cream. Fats and Oils: Extra virgin olive oil and avocado oil. Sir, As per age and height my BMI is perfect, now a days I am doing gym exercise I want to increase my body muscles with out steroids so please tell me best protein powder to increase muscles. I want to take it due to I am alone and diet is not sufficient for me. Please recommend best protein powder. 7 Foods You Should Eat To Lose Weight! Broccoli - Broccoli is one of the most effective foods which can help you lose weight. It contains several micronutrients and phytochemicals which aid in weight loss by breaking down fats. Broccoli is rich in dietary fiber, minerals, and vitamins and low in calories and yet satisfies your hunger. You can eat it raw, cooked or as a healthy snack. Add this green vegetable to your regular diet and hasten your weight loss process. Oats - Oats is a healthy addition to your diet as it high on nutrients and fiber. You should include it in the regular diet for at least 4 times a week if you want to lose weight. You can customize your serving to add more nutritional value to your meal. Avoid sugary toppings as they are high in calories and do not promote weight loss. Do not consume oats with added flavors or any other synthetic ingredients. Apples - Apples are low in calories and rich in fiber. It is a perfect snack which is sweet and satisfying at the same time. It not only helps you to lose weight but also effectively controls your blood cholesterol. Apples contain antioxidants which have a lot of health benefits other than aiding weight loss. Fresh apples are considered to be even more effective in this regard. Cabbage - Cabbage contains only 17 calories in a serving and is one of the best foods for weight loss. You can cook it in olive oil and season it with herbs and add it to your regular diet. Cabbage also helps fight cancer among its other beneficial qualities. It reduces your calorie intake and also satisfies your appetite. It also acts as a natural detox and works wonders for your overall health. Black beans - Black beans are one of the most satisfying proteins which you can consume during weight loss. They are rich in fiber and protein and keep you full for a long time. They contain soluble fiber which helps you fight cholesterol problems. The insoluble fiber in black beans maintains your digestive system and regulates the bowels. Fruit yogurt - You can see visible results if you cut down your overall calorie intake and supplement it with yogurt in your regular diet. The calcium in yogurt restricts the production of cortisol and controls your appetite. Yogurt also contains amino acids which contribute in burning fat. You can add fruits like blueberry or aloe vera to your yogurt to make it a tastier and healthier snack. Whole bean salad - Whole bean salad is simple to prepare and is a very healthy snack. It is filling and keeps your hunger pangs at bay. You can put bell peppers and sweet corn to add flavors and toss it in olive oil to keep it healthy. I am looking to decrease my weight and stay fit. What is the diet and exercise routine I must follow. It's true what they say, you can't out-exercise a bad diet. And abs are made in the kitchen. So the first step to any fat-loss plan starts with improving your diet. First, cut out processed foods, fake sugars and refined carbs. That means cutting out the cakes, cookies, ice cream, deep-fried foods and candy. Next, add more foods to your diet with low-energy density. Said more simply, include fruits, vegetables, leafy greens, whole grains, lean meats and fish in your diet. My question is how many glass of water or litres should drink? And is there any age criteria to this or all can drink the same amount at any age? Thank you. Amount of water intake depends on your body weight and health condition. For every 20kg body weight 1 litre water intake per day is required. I am 20 years old and I am 5'10" tall. I am overweight because my weight is 89 kgs.